Norwich City: Will The Canaries Soar? Norwich City’s recent history has been turbulent. Two successive relegations saw the club drop into League 1 in 2009. Paul Lambert’s appointment and back-to-back promotions returned them to the Premiership, but losing Lambert and a disastrous Chris Hughton reign once again saw the Canaries demoted to the Championship. Now, under new management, they are once more back in England’s top flight. Can Norwich finally make this stick? Here to assess the situation is James Stangroom of Canadian Canaries. Follow the group on Twitter at @CanCanaries. Norwich City ended their season the way many expected: promotion back to the Premier League after only a year adrift in the Championship. The route taken to the top flight was far less certain, featuring a flying start, a disheartening slump, a change in management, and a corresponding rise in fortunes. Hidden beneath the euphoria of leaving rival Ipswich behind and finally conquering regular season nuisance Middlesbrough, there was a distinct sense of relief among the Canary faithful. Failing to bounce straight back up to the Premier League would have led many players to search for opportunities elsewhere, not to mention the challenge for the club to work within the realities of the Championship economy. The golden opportunity of a quick promotion seemed to be in doubt as the team fell freely in the table through October and November, winning only once in those two months. Despite a resurgence in December, Neil Adams ultimately resigned from this position in early January to make way for a young, unknown, Scottish manager in Alex Neil. Neil’s impact on the squad was immediate and positive, with the team losing only three matches under his tenure and eventually reaching – and winning – the promotion playoffs. While Alex Neil has earned the confidence of his players, the supporters, and the board at Norwich City, how he will approach this preparatory summer is still much of a mystery. He will no doubt be given plenty of funds to work with, but he has also shown that he is a prudent “man manager” who demands a high work rate. With no glaring holes that need filling, it is expected that Neil will go shopping to add some Premier League quality to his squad, but a drastic overhaul is unlikely. In goal, John Ruddy remains the number one for his sixth season for Norwich, and barring injury or transfer, he will probably start all of the matches in the upcoming season. Often the subject of transfer interest from larger Premier League clubs, Norwich will no doubt set the fee as high as possible to prevent his departure. Declan Rudd remains the backup to Ruddy, and with the departure of Mark Bunn this summer, Norwich will be looking to improve their depth by signing an experienced keeper as an added contingency. Now that Allardyce has left West Ham, what’s Jussi Jääskeläinen is up to? The Norwich defense was often the target of criticism last season, particularly as defensive lapses cost points and the team slipped down the table. The arrival of Alex Neil, however, coincided with some fundamental changes in the back. Not only did key players like Scottish-international Steven Whittaker see a noticeable improvement in form, the impact of the return of the exiled Sebastian Bassong can not be overlooked. Bassong fell out of favour with former Norwich boss Neil Adams and the former player of the season was sent away on loan to Watford for the first half of the season. Alex Neil took over and wiped the slate clean, welcoming Bassong back to a back four that was in desperate need of stability. Javier Garrido has left the club after being unable to displace Martin Olsson at left back, and it is unclear what role, if any, Michael Turner will have after returning from loan. Although Alex Neil was able to improve the form of the defense under his watch, he will still have to add some quality and depth to survive in the higher division, perhaps more so at the back than in any other positions. As consistent as the back four were in the latter part of the season, there is an alarming lack of options to cover in the event of injury. Bassong returned from Watford to stabilize the back four. The midfield, anchored by player of the season Bradley Johnson, and bolstered by the now-permanent addition of Graham Dorrans from West Brom, is arguably the area of least concern for Norwich this summer. 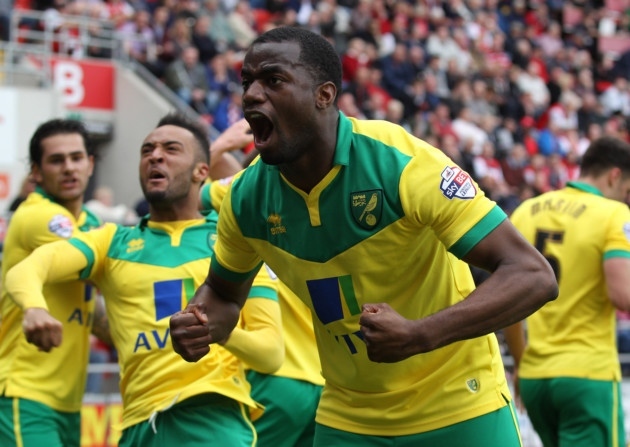 Alex Tettey and Jonny Howson proved instrumental in the middle, while Nathan Redmond flourished under the attacking direction of Alex Neil. Even while featuring for the England U21 squad, many have questioned whether his judgement and finishing would ever catch up to his raw pace and ability. The critics were silenced in the later months of the season, and particularly when he famously scored at Wembley to cap the season off. Redmond has been the subject of rumours linking him with Liverpool, and based on his recent performances, he will be on the radar of many Premier League managers. Veteran Wes Hoolahan featured in most matches this past season, a change approved by himself and supporters alike after falling out of favour under Chris Hughton. But, at 33, he will be eager to prove his worth again in the top division after seeing the pitch only 16 times the last time Norwich were there. The Norwich strike trio of Cameron Jerome, Lewis Grabban, and Gary Hooper had no trouble scoring last season, amassing 44 between the three of them. 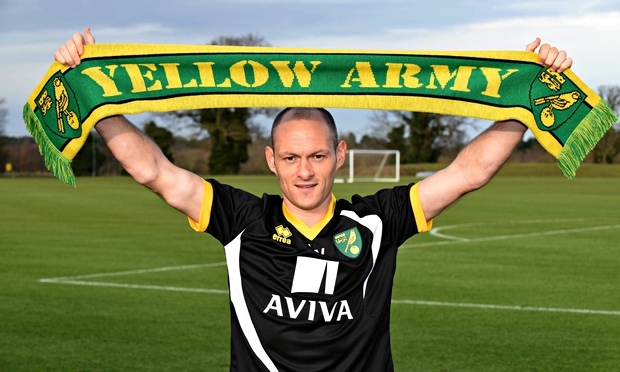 Like all other areas, Alex Neil will no doubt be looking to add depth here over the summer. Hooper might find it the hardest to see action in the lone-striker tactic that seem to be Nei’s preference, and any incoming strikers will only make that more difficult. The question that some are wondering is whether or not an addition will come in the form of record-signing Ricky van Wolfswinkel, who spent the entire season loaned out to French side Saint Etienne. Van Wolfswinkel never lived up to his expectations in the 2013/14 campaign, collecting just one goal. With the loan now expired, Alex Neil must now decide whether to loan him out again, sell him at what will likely be a substantial loss, or give him the opportunity to break into the squad. In defence of the Dutchman, he wasn’t given much in the way of service under Chris Hughton’s stifling, ultra-defensive style, but it would be a small miracle if he would be able to displace any current or incoming striker for their job, and he will almost certainly be loaned or sold as soon as the opportunity arises. Just ask Luciano Becchio, the recently-released striker who spent over two seasons on the outside looking in, despite being a proven scorer for Leeds. Kyle Lafferty also finds himself returning from loan with no guarantee of a place in Neil’s team. Alex Neil will certainly be looking to improve his squad for the upcoming Premier League season. While he has already shown that he is a promising tactical manager on the pitch, this summer will give him the chance to apply his tactics to the transfer market, with a budget he could have only dreamed about mere months ago. His last summer was spent preparing Hamilton Academical for the Scottish Premier League, which is a similar position to the one he finds himself in now, only the scale has expanded considerably. Despite having a transfer budget to work with, any money spent will probably be done so carefully and conservatively with the intention of laying the groundwork for a lengthy stay in the Premier League rather than a QPR-style carpet bombing. Spending wildly doesn’t guarantee success, and if the first few months of the Alex Neil era are any indication, he will likely bypass highly-priced individuals in favour of players that fit the culture that he has been creating at Carrow Road. Even with a squad of players that possess plenty of top flight experience, and with a summer of improving the general quality, Norwich are still in for a tough fight next season. A successful campaign will be one that sees the Canaries avoiding relegation, with a finish above the bottom third of the table being an unexpected treat. Alex Neil faces his biggest challenge yet, but after salvaging a season and turning it into a thrilling promotion ride, he has a perfect chance to make his mark. If nothing else, he has shown that he can get the most out of his players, a trait that could prove to be the difference between survival and the drop in the coming season. Related: – £5.14bn to watch Armand Traore?